Keepers at Torquay’s coastal zoo are preparing the ground for some fierce competition. They are cutting the grass and clearing undergrowth so that one species of bird can indulge in its extraordinary mating ritual. The ruff (Calidris pugnax) is an unassuming medium-sized wading bird that breeds in marshes and wet meadows across northern Europe. Females are grey-brown and white with grey mottling, and so are males – most of the time. 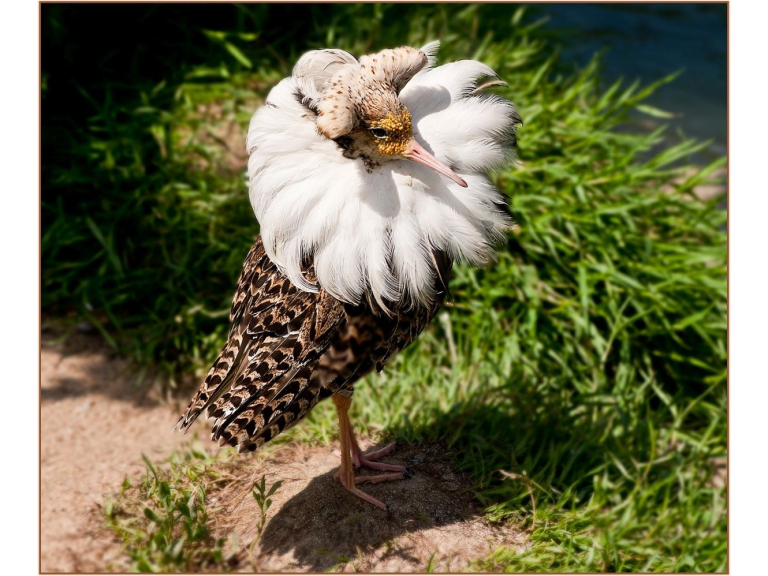 But, as the breeding season starts, the male is transformed with brightly-coloured head tufts, an orange face, a black breast and the large collar of ornamental feathers that inspired this bird's English name. Between May and June, and before mating takes place, males display at a lek in an open grassy arena. A lek (the word is from the Swedish for play) is where males gather to display, competing to lure females to mate. Their display includes fluttering, jumping, crouching with the ruff erect and lunging at rivals. Interestingly, the ruff is one of the few lekking species in which the display is aimed more at other males rather than the females. It’s not only birds that take part in lekking - wasps, crustaceans, fish, amphibians, reptiles and mammal species all do it, too. The ruff is actually a sort of sandpiper. It migrates and can forms large flocks in winter. Classified as Least Concern on the IUCN Red List, the global conservation risk is seen as relatively low because of the large numbers that breed in Scandinavia and the Arctic. However, the range across much of Europe is contracting because of the drainage and improvement of land and over-hunting. For more information go to www.livingcoasts.org.uk or ring 01803 202470.